' %systemroot%\SysWow64\cscript.exe, or a 64-bit OLEDB Provider.
' Dim contactsDN: contactsDN = "OU=Contacts, DC=domain, DC=com"
' Dim contactsExport: contactsExport = "export.csv"
' Dim strUserType: strUserType = "Business"
' Dim strUserType: strUserType = "Home"
' Dim contactsExport: contactsExport = "C:\scripts\export.csv"
Dim contactsDN: contactsDN = "OU=Contacts, DC=domain, DC=com"
Dim contactsExport: contactsExport = "export.csv"
objCommand.CommandText = "SELECT ADsPath FROM 'LDAP://" & strContactsDN & "'"
strResult = objRecordset.Fields.Item("First Name") & " " & objRecordset.Fields.Item("Last Name") & ":"
strResult = strResult & "ERROR,ERROR,ERROR,ERROR,ERROR"
strResult = strResult & "SUCCESS,"
strResult = strResult & "ERROR,"
strResult = strResult & "ERROR"
strResult = strResult & "SUCCESS"
Cannot open the Outlook window. The server is not available. 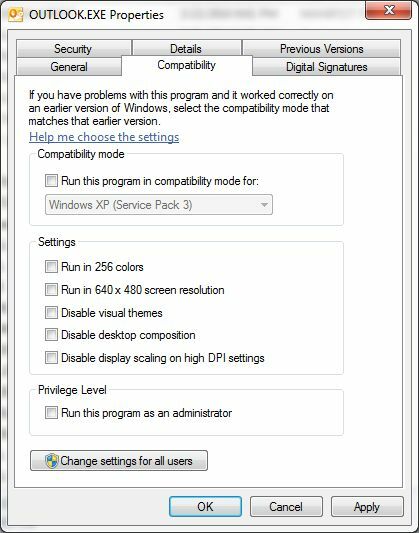 Outlook was installed with compatibility mode. (Note: 14 is for office 2010, yours may vary depending on your version of Outlook). Right-click the OUTLOOK.EXE, and select properties. Use the /resetnavpane when opening Outlook.